On April 3rd, Arizonans come together for a day of online giving to the causes closest to their hearts. These are some of the rescue cats who call the STCAZ sanctuary home. These are the faces of those who benefit from charitable giving. Help us give them a safe, healthy, and happy 2nd chance. Please consider giving on April 3rd, or scheduling your gift in advance. 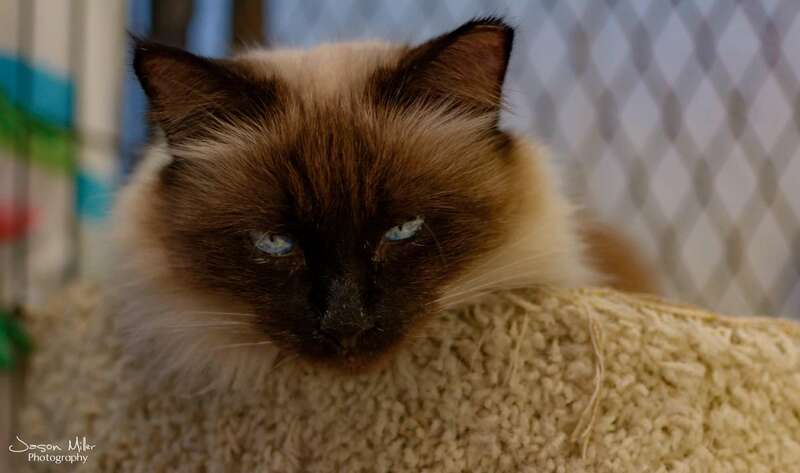 We feel incredibly blessed to be able to offer a refuge for the more than 40 rescue cats who will live out the rest of their lives at the Save the Cats Arizona sanctuary. This giving day we ask for your support as we continue our shared mission to make a difference in the lives of abandoned cats- with your help. We are asking our friends and patrons to help us get some very special felines some much needed dental work. As you can imagine, homeless cats usually do not have access to a proper diet, eating anything that will ease their hungry bellies. For this reason, as well as their lack of medical attention & preventative care, street cats are much more susceptible to severe & painful mouth conditions. Moderate to severe periodontal disease can cause constant drooling, difficulty eating, and inability to properly groom or to defend themselves. Last month we had great success getting 33 of our feral cats examined, vaccinated, and tested! A huge Thank You to our fellow animal welfare advocates at the AZ Humane Society, who visited the STCAZ sanctuary with the Healthy Tails Mobile Veterinary Clinic, and completed this awesome feat with the assistance of dedicated STCAZ volunteers. The $3000.00 cost was well worth it; the results came back showing eleven cats diagnosed with periodontal disease, seven of whom are considered to be severe. As their guardians, we are committed to the health and safety of these innocent cats. Dental appointments are being scheduled, respite care is being planned, short-term fosters are being requested so the cats have a calm, supervised place to heal until they are ready to return to their home at the sanctuary. 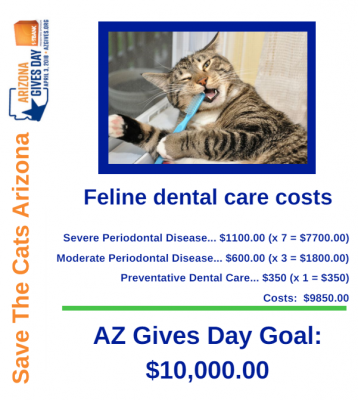 Please help us make this all possible with a monetary donation to Save the Cats Arizona’s AZ Gives Day. All donations are tax deductible and a receipt will be provided.